According to recent distracted driving statistics, of the 33,808 car crash deaths that occurred in 2009, approximately 27,046 are suspected to have resulted from distracted driving. Even more shocking is that while drunk drivers are 7 times more likely to cause accidents, distracted drivers are 23 times more likely to do so. To date, only a handful of states have instituted distracted driving laws, but the majority of them are not very strict despite the increasing number of distracted driving deaths that occur nationwide each year. McIntyre Law, P.C. 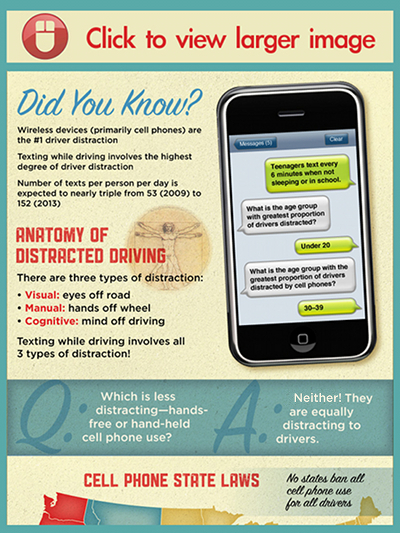 has created this infographic in an effort to educate drivers on the dangers of distracted driving, whether the distraction comes in the form of cell phone use, eating while driving, or simply talking to passengers. It is our hope that by sharing this information, distracted driving statistics will improve, and distracted driving deaths in Oklahoma—and everywhere—will decrease. Don’t use your cell phone while driving, to talk or to text. If it’s important and can’t wait, pull over. Try to avoid eating while driving, even on long road trips. Eat inside the restaurant, or visit a rest stop. Program your GPS device before you begin driving. If you must make an adjustment to your route, pull over. Ask passengers to remain calm and quiet while you’re driving. Some conversation is okay, but try to keep it to a minimum, and avoid raising voices. If you or a loved one has been injured by a distracted driver, or your family has suffered a distracted driving death, contact the attorneys at McIntyre Law, P.C. to learn more about your rights, distracted driving laws, and how we can help you recover from your injuries. Call 1-877-917-5250 now for a free consultation.